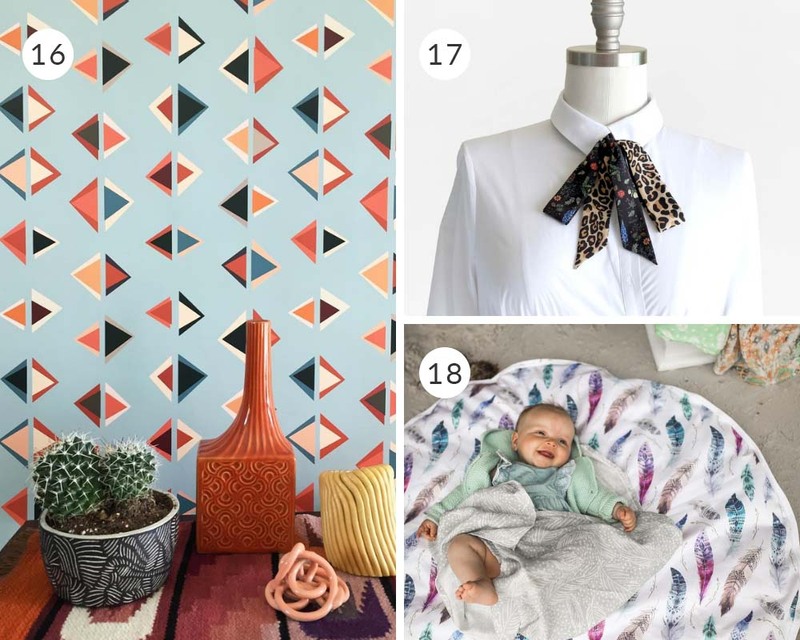 Search #spoonflower on Instragram, and you’ll find a plethora of makers doing really creative things with our fabrics and papers. 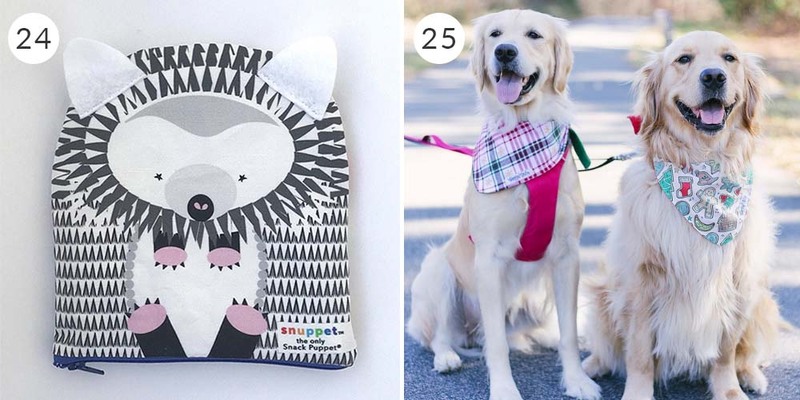 Thousands of entrepreneurs, makers and businesses big and small are powered by Spoonflower’s on-demand digital print process. Our Marketplace of designs sourced from independent designers all over the world has taken our maker community to a place we couldn’t even imagine when Spoonflower first started. On Small Business Saturday, and every day throughout the year, we are proud to support these creative makers and businesses who have helped make Spoonflower the community it is today. While we’re shining the spotlight on 25 makers in this post, we encourage you to see what other makers are creating in our Meet the Maker series. You may recognize Robert from his appearance on Season 1 of the punderful craft show Making It, but we first fell in love with Robert’s work when we discovered his DIY embroidery kits. 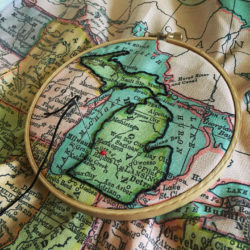 He’s even stopped by the blog to share some of his embroidery tips for personalizing a world map. Inspired by sea-side living and her African heritage, Jo Kalute’s business, Clovelly Cozzies, offers timeless beauty that is accessible to women all across the globe. While Jo will be spending her holidays on the beaches of Australia, if you’re currently in a #sweaterweather mood, you can also find Jo’s work in her Spoonflower studio. Beautifully designed and crafted zipper pouches, tea towels, art prints and cards are what you’ll find when visiting Emily’s online shop, Emily Walker Art & Design. 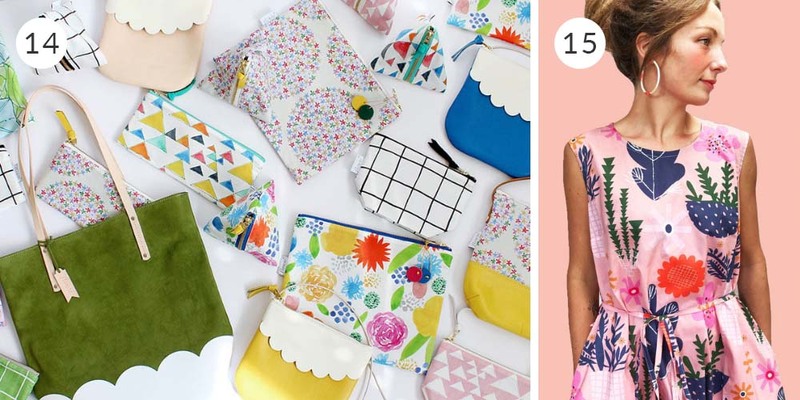 The painter, illustrator, designer, and all-around creator of beautiful things finds inspiration for her handmade accessories from flora and fauna, geometric patterns and unique color combinations. When your mission is to design modern, colorful textiles and make creative and fun everyday items for your customers, we don’t think you can go wrong. 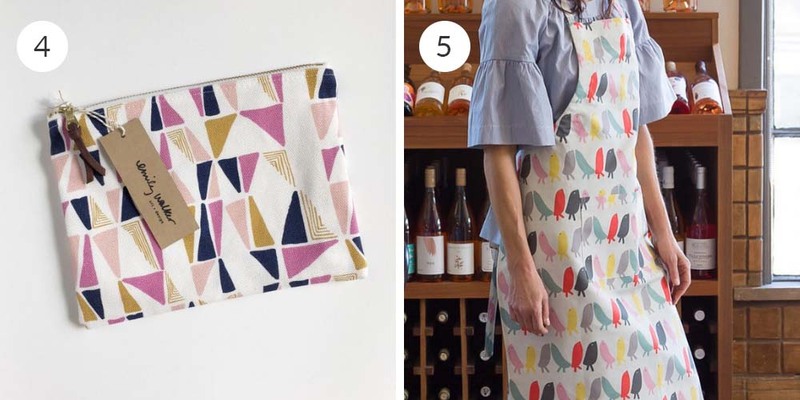 From aprons and handbags to home textiles, the mod designs found at San Francisco based company Kaoru Sanchez are a timeless addition to your collection of handmade goods. “With only 8% of designated historic sites representing the history of minority populations (women, people of color, LGBTQIA), the Tiny Activist Project seeks to highlight lesser known stories of people who fought to save cultural resources.” We are so inspired by Sarah’s work to share the importance of historical preservation and her Tiny Jane cut-and-sew doll kits will inspire activists of all sizes. 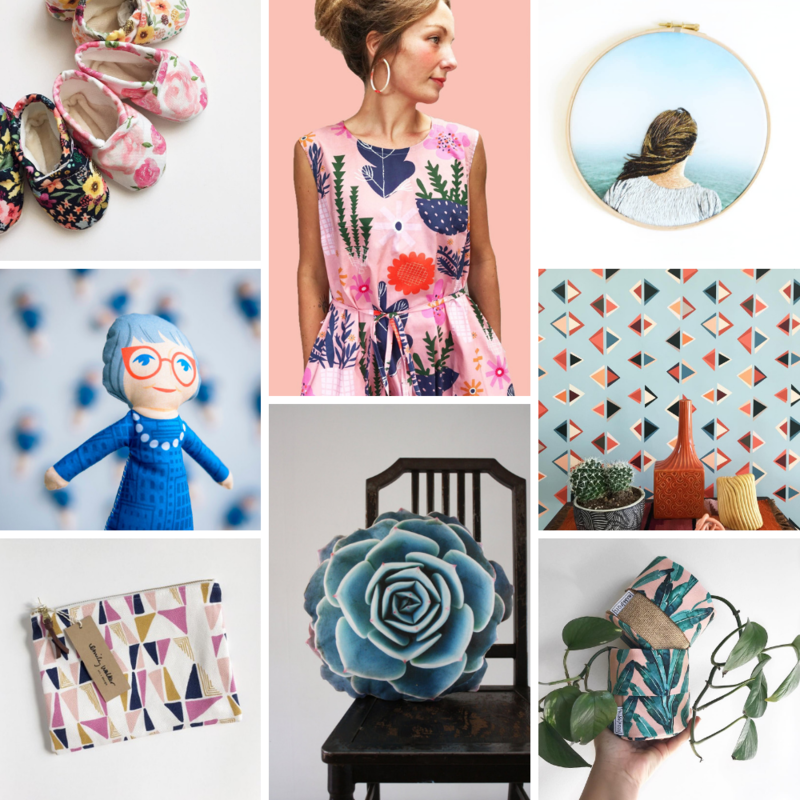 Artist, pattern designer and maker – what can’t Fern Leslie do? Filling her shop, Fern Leslie Studio, with modern quilts for babies, and quilted Christmas stockings made from fabrics she designed herself, Fern’s style has been described as modern, classic, funky, gorgeous, and eclectic –a little bit of everything! Do you find yourself spending a majority of your time crafting the ultimate houseplant oasis? Give your air-purifying décor an extra boost of style with a handmade plant holder from Miss Pots. The mother-daughter duo started making the fabric pouches for their houseplants and the business quickly grew into a family-run business when Carol’s two daughters joined. Pattern maker, textile designer, amateur photographer, fabric wizard (aka seamstress), wielder of needles (aka slow knitter), animal lover (aka certifiably obsessed dog/cat mom). 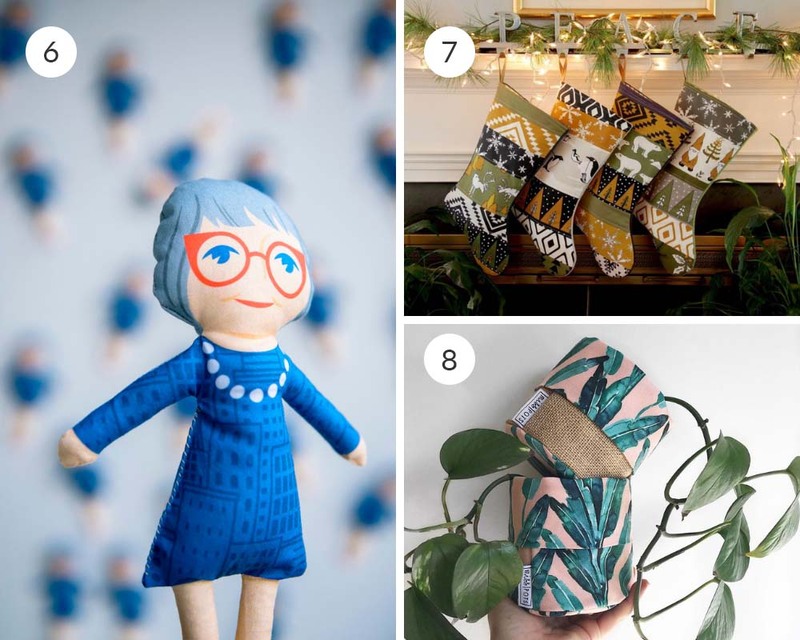 These are just a few ways to describe Rochelle New, the one-woman show behind Home Row Fiber Co. Rochelle has stocked her shop with handmade goods like portable yarn bowls and our favorite, keepsake bags, featuring her custom printed designs. Get to know more about Rochelle in her recent episode on Love to Sew. The Dutch embroidery artist is quickly making a name for herself as she embroiders over photographs printed on fabric. The photos come to life as she adds depth and texture through the use of thread. We also can’t forget to mention the punny t-shirts available in Floor’s shop, which include phrases like “Pardon my french knot”. 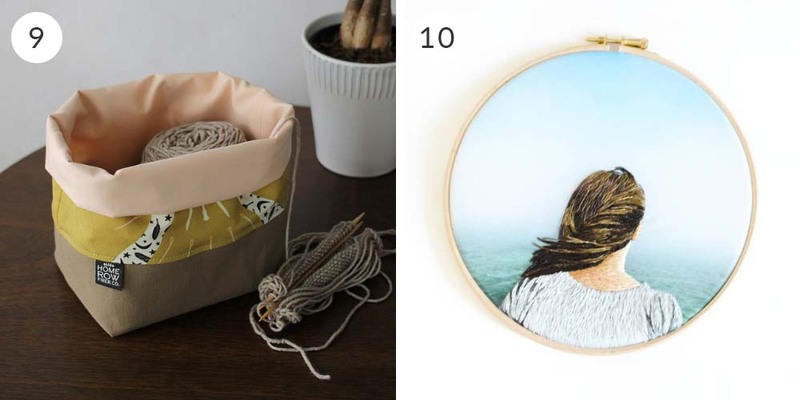 For an added bonus, you can learn how to embroider your Spoonflower printed photos just like Floor with the help of her Skillshare class. After searching for washable and durable soft-soled moccasins for her son with no results, Clamfeet founder Julie Engelhardt knew she had to take things into her own hands feet. 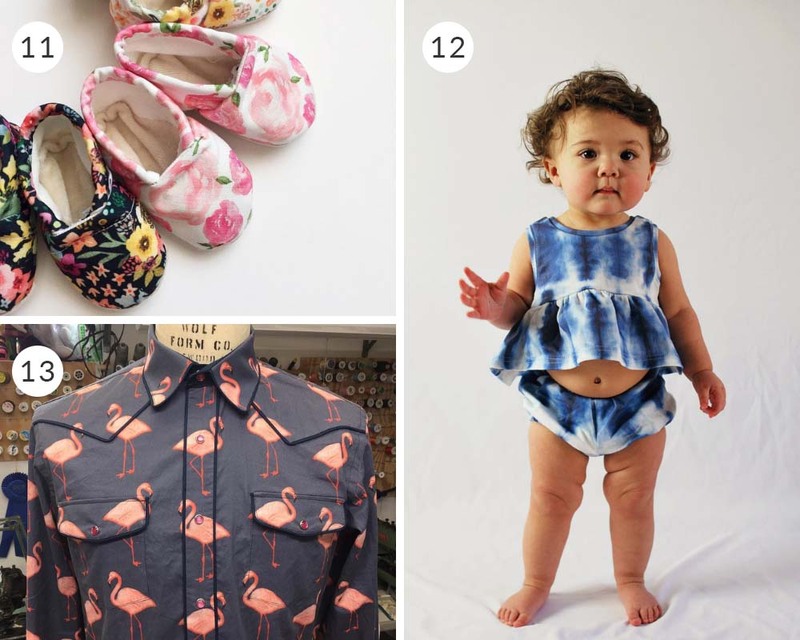 Julie has built her brand to outfit tiny toes in bright and bold designs like butterflies, geometrics, florals and stripes. Founded in 2014, Lola & Stella was created to produce quality organic clothing for stylish kiddos. Each piece is made from start to finish in the U.S and Marissa has filled her shop with Spoonflower designs printed on Organic Cotton Knit. We’re particularly smitten with the rompers. Talk about #patternmatchinggoals! Eugene’s custom shirts first caught our eye when we, much like the entire Spoonflower community, were in awe of his pattern matching skills and attention to detail. The one-of-a-kind shirts feature designs tailored to the wearers interests and personality. 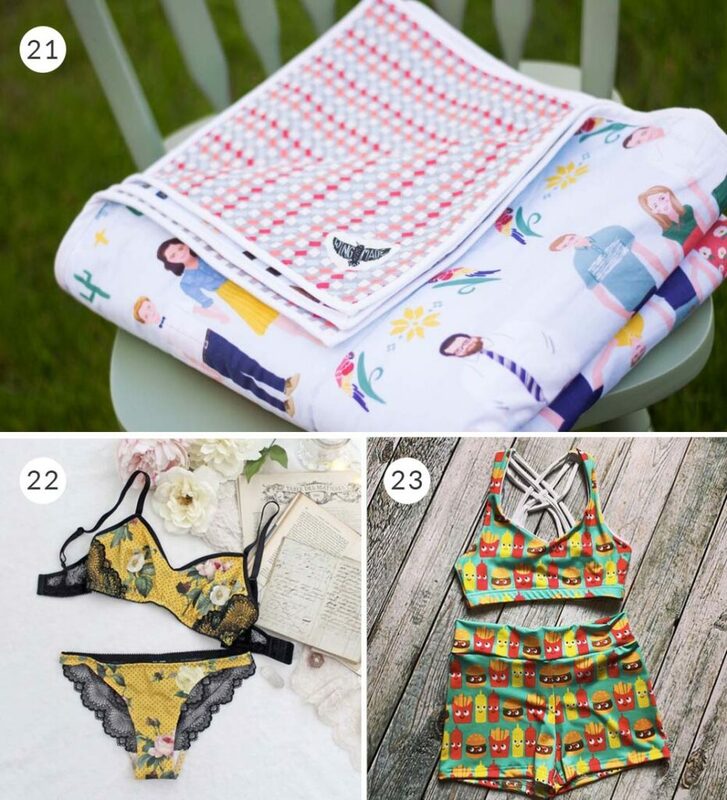 We’re always impressed when a Spoonflower maker and small business owner also designs their own fabric. After earning a bachelor’s degree in English, she moved to California at age 21 to study design and soon after launched her small business, Flowie. 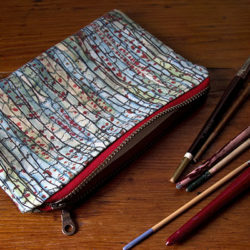 Her store offers beautiful made-to-order bags and accessories featuring her charismatic watercolors, also available in her Spoonflower shop. After an unconventional start growing up as a child actress and singer on sets and sound stages across the country, Kathryn Zaremba received a Bachelor of Fine Arts degree and moved to New York City, where she was a design assistant to Jonathan Adler and illustrated textiles for Rachel Antonoff. Kathryn’s whimsical wallpaper has caught the eye of interior designers, home dec junkies and even a few celebrities. We’re pretty sure Cinne Worthington may have single-handedly renewed our interest in decorative scarves. Located in San Francisco, she spends her days in her in-home design studio on the old industrial waterfront of a vibrant historical neighborhood called Dogpatch. Between her Etsy shop, C.Banning Accessories, graphic design business and Spoonflower shop, it’s safe to say Cinne is keeping herself busy! Focusing on ethically-sourced fabric and a handmade process, Hello Fred takes great care to create a product and brand that encompasses awareness, kindness and compassion. Between the playmats and blankets, we don’t think it can get any cuter! After meeting Becka Rahn, you could say she knows Spoonflower inside-and-out. Co-author ofThe Spoonflower Handbook, Becka has the unique skill of turning anything she sees into a surface pattern. 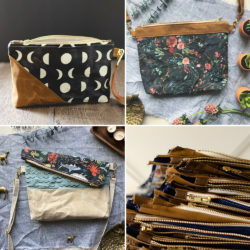 The zipper-tab scarves and paper-cut pattern purses found in her shop will make you think twice about that piece of “garbage” you saw on the ground! Whether she’s teaching a Spoonflower Handbook Master Class or working on a new design for her Spoonflower shop, Becka truly is a Jane-of-all-trades. Green thumb or not, succulent pillows from Plantillo will always stay alive! Searching for the best flora the season brings while on walks and bike rides in the San Francisco Bay Area, Sabine turns her succulent photography into one-of-a-kind pillows so you can bring the outdoors in. Elisabeth’s life and creative passion is the heart of her family, and it shows in her business: custom family portrait illustrations. 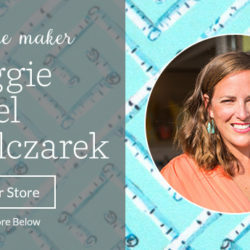 Her love of product design and sewing means that Elisabeth also turns her illustrations into colorful soft goods such as quilts, wall hangings, pillows and just about anything else she and her customers dream up together. After accepting an administrative position back in her small home town of Orillia in Ontario, Canada, sewing lingerie became a creative outlet for Sarah. 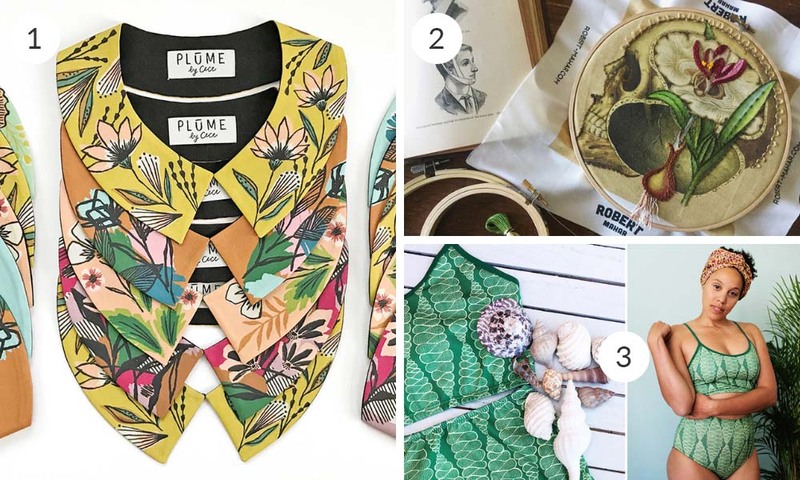 Incorporating her love for delicate fabrics, feminine print, and vintage patterns all into one garment, Sarah quickly turned her hobby into a flourishing business that’s part DIY, part ready-made. When Sarah Goff transitioned her focus from CrossFit to weightlifting, she wanted to find a way to raise money to build her home gym. After making athletic bras and shorts for her friends to raise money, she eventually started making them for their friends and THEIR friends and before she knew it, Stitches in Steel was born! Whether you like your workout gear bright and bold or subtle and low-key, Sarah’s handmade apparel is a guaranteed PR in style. We’ve always been told not to play with our food, but when your snacks turn into puppets, that’s almost impossible! Snuppets™, a snack puppet, was dreamed up by Janie Allen when her kids headed off to school with packed lunches and she wanted to instill the important habit of reusing rather than disposing. Her product line has evolved over time but always with one thing in mind: to create eco-conscious products and solutions for families. Are you a small business owner or considering taking the steps to owning your own business? 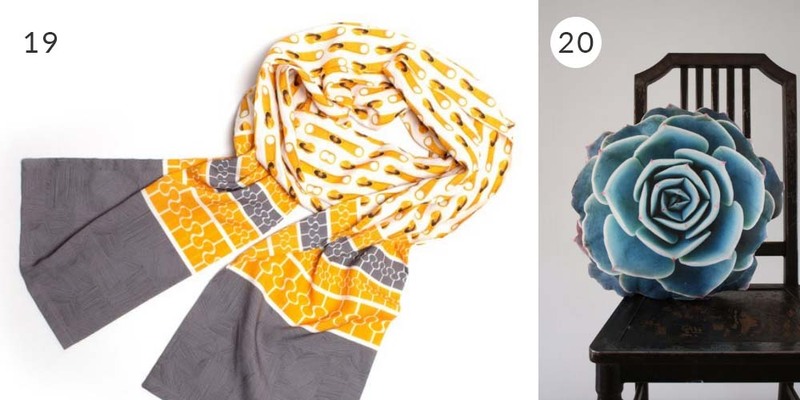 Read these 15 tips from the Spoonflower maker community to set yourself up for success. On Small Business Saturday, don’t forget about all the independent designers supporting these Spoonflower Makers. Get to know a handful of the designer community in our Meet the Designer series and shop your favorite designs on fabric, wallpaper and gift wrap in the Marketplace.